We will meet at 9am at our snowmobile rental center, located at Ste-Marguerite-du-Lac-Masson. You will file some formalities like the rental agreement. Then, you will receive your snowmobile equipment and learn some security rules and driving advices. You will be ready to leave for the half day on the Quebec network of trails. In this escapade, you will enjoy the most beautiful landscapes in Quebec. You will cross magnificent snow-covered forests and mystical lakes. Your guide will lead you carefully all along the way and will customize your ride. In the afternoon we will meet on the second place for dog sledding. 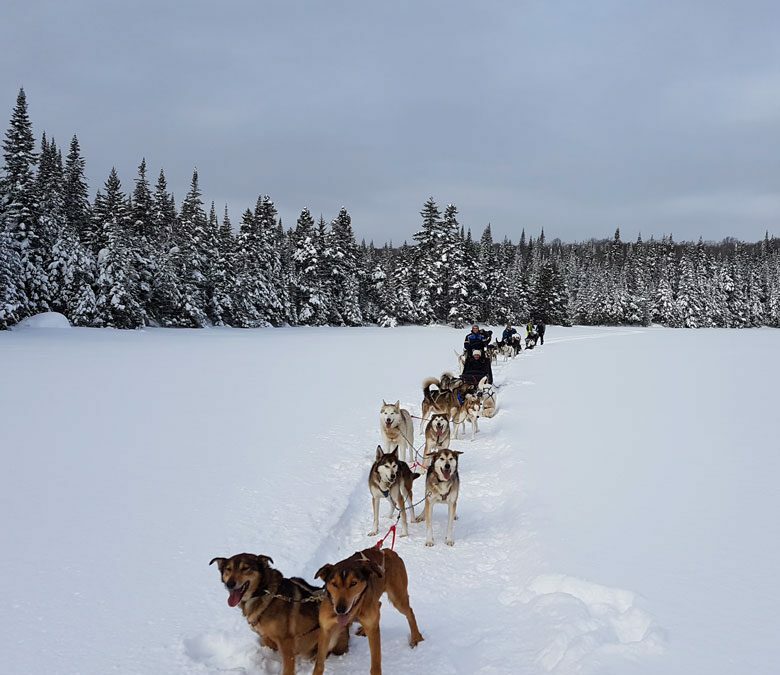 You will discover another way to cross our magnificent forests, led by a musher, a dog team driver. You will enjoy new sliding sensations and petting the dogs at the end of this beautiful experience. We do not provide the equipment for this activity, so you must dress warmly (anorak, winter cap, gloves, winter footwear and trousers). This does not include the lunch. The order of the two activities can be modified depending on schedule and availability. For every rent from Monday to Friday, we offer a $10 discount per snowmobile for a half-day and a $20 discount per snowmobile for a full day, including taxes. This offer will be effective from Monday, January 7, 2019. Children under 10 : $50 off on half day and $70 off on full day (taxes included). Snowmobile deductible insurance : $2000 or $2500 per machine, according to the model. We require a security deposit of the same amount via Visa or MasterCard credit card (Please check your line of credit before so).